The weather had been beautiful lately, and I always wish for a rescue to do while the weather is so nice. But it seems that most of my rescues happen when I am either being chased by rain storms or on very hot days. This time, however, I got my wish. It was a cool, clear and dry day when the phone rang. This time it was from Angie, a cat rescuing acquaintance that I had met once before. Her cat, Cruiser, was stuck in a tree in her neighbor's yard, and she wanted me to see if I could get him down. Cruiser had found his way to Angie's by hiding unseen in someone's car. He was a one year old Russian Blue boy, and he made quite a few friends in the neighborhood. 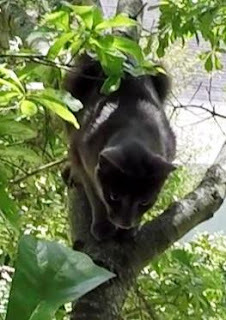 While he was very friendly to Angie and the neighbors, he was generally afraid of strangers, so I was not sure what to expect from him once I reached him in the tree. The good news, however, was that he was highly food-motivated. When I arrived, he was resting calmly in the fork of a branch about 20 feet high over a concrete driveway. he could be enticed with food to come to me. He was on the branch about 10 feet away from the trunk of the tree at first, but when I climbed up to him, he got nervous and walked farther out on his branch. After a few minutes more, he climbed even farther and higher on the branch by going out to the small limbs at the extreme end. This was not a good sign, but maybe I could entice him back closer to me by offering food to him at a distance. I opened a can of food and put it in a container which I held out close to him and far away from me. He showed no interest. Indeed, I had trouble getting him to even look at it. While he was quiet and calm and not showing any signs of serious stress, he still was apparently stressed enough to have no interest in food. All this time, the neighbors were below holding a sheet tightly between them in hopes they could catch Cruiser if he fell or jumped. Since Cruiser was over a concrete driveway, that was a very good idea. After spending a few minutes on the small limbs, Cruiser decided that was not comfortable, so he came back down a bit to rest on a more comfortable spot where the branch was a good bit larger. He never made any cries and never looked panicked or stressed. He appeared to be more tired and sleepy than stressed. While Cruiser was way out at the end of the limb, I had walked out on the branch to get closer to him. When he came back down, I was now closer to him than before. I tried once again to offer him some food, and this time I could put it right under his nose. Yet, again, he showed absolutely no interest. I was very patient -- some would say too patient -- in giving him plenty of opportunities to change his mind and get interested in the food. 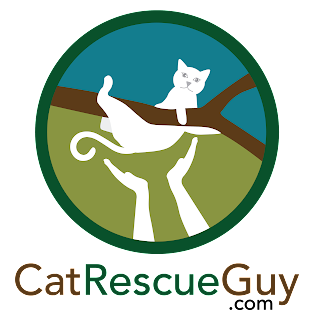 I wanted to be sure that I had exhausted the easy rescue options, because the next option was to use the rescue pole. I pulled up the rescue pole and prepared myself and my gear for the attempt. 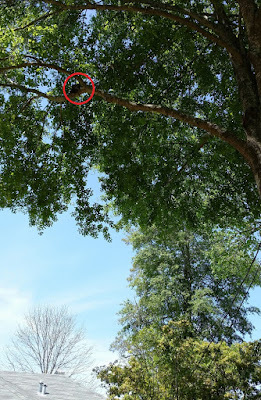 I always practice the procedure at least once in the tree before actually doing it, because I need to be sure I do not run into any surprises that would cause me to keep him in the noose any longer than necessary. Once I was ready, I began to place the noose around him by trying to pull it under his front legs. He was not bothered by my attempts at all, but he wasn't cooperating either. I needed him to lift his front legs so that I could slip the noose under them. He wasn't helping even though I was pulling him in various directions to get him to move. It took a few minutes, but I finally got him to move enough to get the noose under him and properly snare him. When I lifted him, I was surprised by how heavy he felt. He handled it very well and did not struggle at all, but when I tried to push him into the net, he held on to the netting with his claws and made it difficult for me to get him all the way inside. I had to pull one foot at a time out of the netting a few times until I could get him all the way down. Once he was safely in the net, I released the noose, withdrew the pole and brought him down. Angie took him home and released him inside. He was clearly relieved to be home, out of that net, and out of that tree. After he settled down, he ate, drank, got some loving and took a long nap. He is doing just fine now, and is back to making his rounds to all the friendly neighbors.